Can You Eat Whole-Wheat Pasta on a Low-Carb Diet? Don't let your love of pasta keep you from starting a low-carb diet. 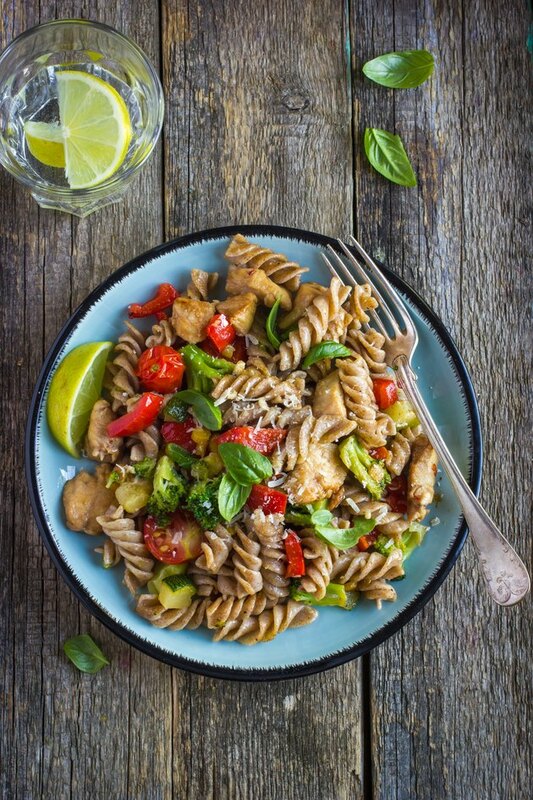 While you may not be allowed to include carbohydrate-rich food during the early phases of this type of diet plan, foods like whole-wheat pasta can be added to the menu as you lose weight and your carb allowances become less restrictive. Just be sure to stay within your limits by carefully tracking your carb grams. A low-carb diet has no set definition. Restrictions range from 20 to 150 grams a day. But many of the popular commercial low-carb diets, such as Atkins and South Beach, start with what's called an induction phase, which restricts carbs to 20 to 50 grams a day to help kick-start weight loss. With 19 grams of carbs in a cooked 1/2-cup serving, whole-wheat pasta will use half or all of your daily carb needs. During early phases of the diet that impose such tough restrictions, most of your carbs should come from nutrient-rich veggies such as spinach, broccoli and kale. As you lose weight, however, your carb allowance increases, usually to 60 grams or more, which may allow room for whole-wheat pasta here and there. While 1/2 cup of whole-wheat pasta has 19 grams of carbs, you don't have to count all 19 toward your total carb count. Whole-wheat pasta is a source of fiber, which means you can count "net" carbs, or digestible carbs, which subtracts the fiber from the total carb content. So, 1/2 cup of cooked whole-wheat pasta has 16 grams of net carbs, which is 19 grams of total carbs minus 3 grams of fiber. By comparison, the same serving of regular white pasta has 21 grams of net carbs, which is 22 grams of total carbs minus only 1 gram of fiber. Even if you're on 60 grams of carbs a day, a 1/2-cup serving of whole-wheat pasta uses up a quarter of your daily carbs, so you still need to do a little planning to fit it in. Use measuring cups to keep portions in check. Add meats such as ground meat, meatballs, shrimp or sliced chicken to add carb-free bulk to your meal. Low-carb veggies also work -- such as 1/2 cup of cooked broccoli and 1/2 cup of cooked cauliflower totaling 4 grams of net carbs -- and they up the nutritional quality of your meal. You'll need to count the carbs in spaghetti sauce, too, which has 6 to 11 grams of net carbs per 1/2 cup. While not the same as whole-wheat pasta, there are lower-carb pasta-like options you can use that won't cost quite as many carbs and may work during the early phases of your plan. Shirataki noodles are made from konjac root and have less than 1 gram of net carbohydrate per 4-ounce serving. Look for these low-carb noodles in the refrigerated section of your grocery store. You can use them just as you would your usual pasta. Spaghetti squash, which has 2 grams of net carbs per 1/4-cup serving, also makes a good swap for your usual pasta. Or, you can make noodles out of low-carb veggies such as zucchini, yellow squash or jicama. Just use a vegetable peeler or a special veggie noodle maker to create long, thin strands. Can a Diabetic Eat Spaghetti? Will Pasta Make My Muscles Bigger? Oatmeal or Cream of Wheat on a Low-Carb Diet?